HOFFMAN ESTATES, Ill. — The Rochester Lancers are going to the Major Arena Soccer League semifinals. Boomer Steigleman scored 3:19 into sudden-death overtime to register a 4-3 comeback win over the Chicago Mustangs in the Eastern Division championship game at the Grand Sports Arena Thursday night. Competing in its first season the league’s second tier, Rochester qualified for the M2 Final Four, which will be held in Ontario, Calif.
What made the result more rewarding for the Lancers (9-4) was that they overcame a 2-1 halftime deficit and the fact the visitors dropped both regular-season matches to Chicago (10-3). As it turns out, Steigleman had the first and last words of the game, scoring off a Jeremy Ortiz feed at 10::51 of the opening quarter. The Mustangs, however, struck twice in the second quarter to grab a 2-1 halftime lead behind Adrian Ortiz (7:33) and Alexis Camaerna (10:25). The third quarter was just about all Rochester, which tallied twice within 62 seconds. First, Jake Schindler equalized at 3:30 before Jayme Kapinos lifted the team into a 3-2 lead at 4:32. Chicago managed to tie things at 3-3 with 2:30 remaining in the period on Camarena’s second goal of the match before Stiegleman produced his dramatic heroics. Immediately after the winning goal, there was a confrontation on the field that apparently was started by an angry and disappointed Mustangs side. 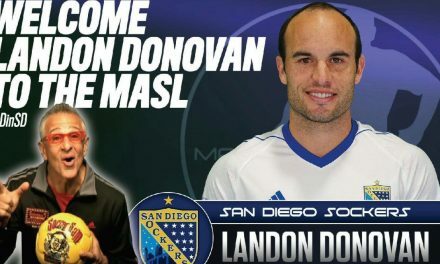 GETTING PERSONAL: Landon Donovan talks indoor soccer, his life on Kick This!